I have come to love running. I got into running about a year ago after ending up in hospital twice in three karate lessons. After the second time my wife and I had “a conversation” and I agreed to take up a sport less likely to cause injuries. I clearly picked the wrong one though. So much for being a step down from full contact Karate. Sure enough, a year on I have been injured from running by trying to run too far in the winter snow while wearing free-running shoes. Now, fully healed, I am back on the road wearing better footwear and running almost every day. I manage this by running in the gym during my lunch-breaks and while running machines are something I have always hated day after day I stay motivated. How? 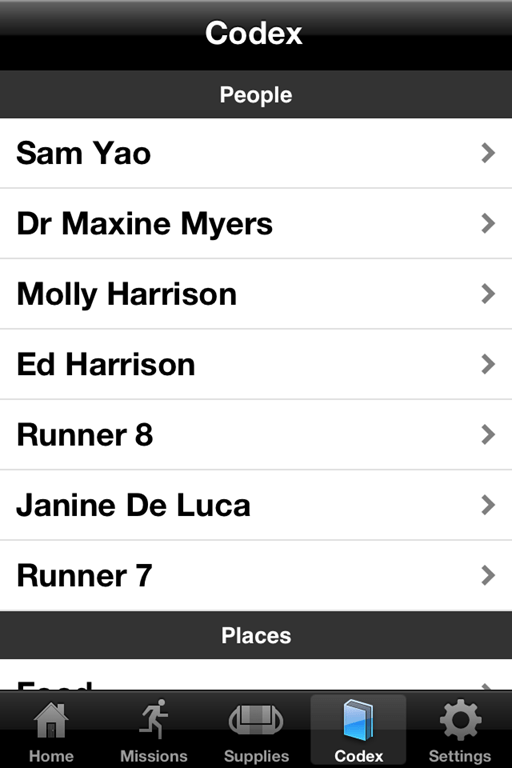 The iPhone is a brilliant runners device. 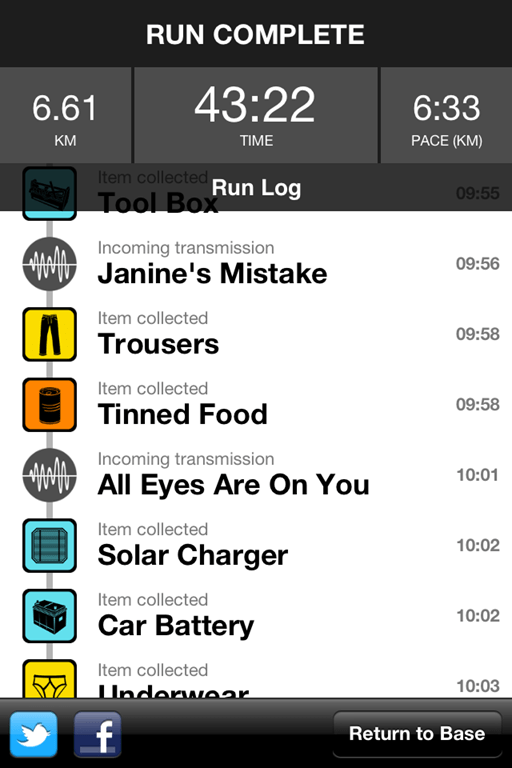 It has SatNav built in, large storage space for music and re-invented the application market for indi-developers. Into this arena it was inevitable that someone would come up with an application that goes beyond simply tracking the distance and time by crossing it with a game. 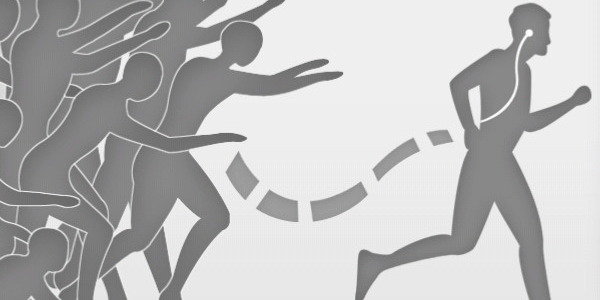 The basic idea is that the phone will use the GPS or accelerometer to play a game of chase. The potential for games like this is huge. Indeed there are other games of this type involving “Zombies”, but nothing so professional as this. The basic idea of “Zombies, Run!” is that you are a survivor of the “Zombie Apocalypse” living in a small township of survivors somewhere in the country near some larger settlements and cities. 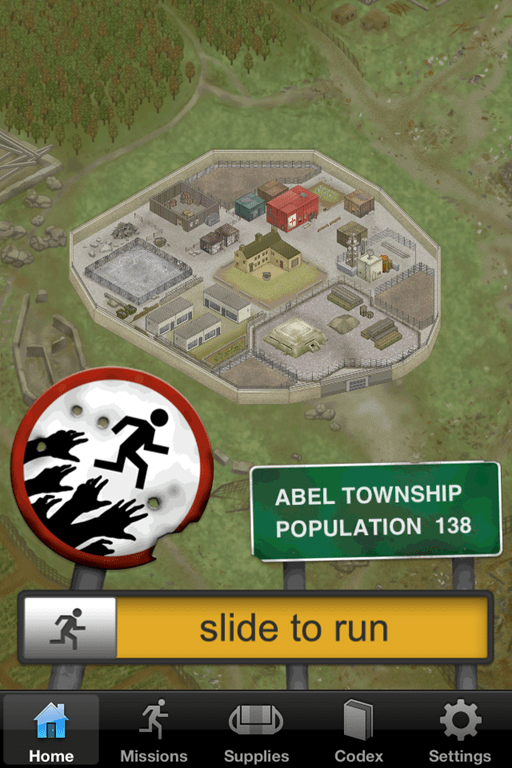 Your job in this township is to be a “runner” sent out into the zombie infested world to collect supplies such as food and medicine, which you then use to increase the size of the township and unlock new missions. 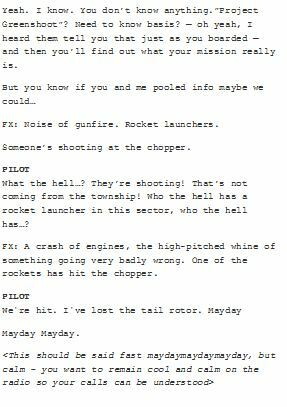 The missions expand the storyline and include such elements as your arrival in the township, the rescuing of people stuck in the wild, intrigues with other enclaves and the military who may – or may not – “know something”. The form that playing the game takes is that you simply walk/jog/run your route as usual, with a robot voice informing you when (and what) you have picked up, all the while you listen to the voice actors speaking lines from the story mixed in between your iPod’s tracks. There are no buttons to press or anything to read, it’s all done by voice and automatic once on the road. The game includes a number of well drawn characters such as other runners, the controllers back at the township and the zombies themselves. Yes, the zombies. 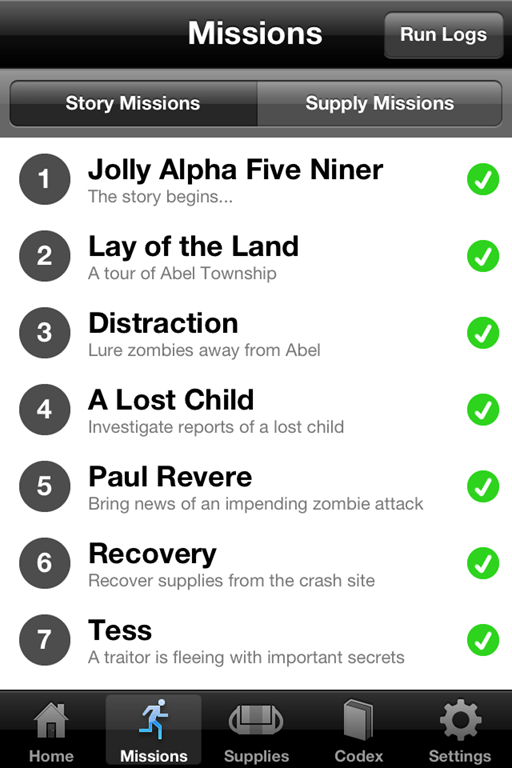 Here’s the kicker: Occasionally, plot demanding, but usually a few times in your run, you will be chased by zombies. These are the “turbo” zombie types found in films such as 28 Weeks Later who can really shift it. You have to speed up (walk to jog/jog to run/run to sprint) and outrun them or they will catch you and force you to drop the supplies you have picked up (meaning that you won’t be able to unlock new missions). How much do you have to speed up? I read that it was 20%, which doesn’t sound like much, but when I run on the machine I usually hover around 8.5 to 9 and have to speed up to 13 to avoid them. That is really running hard. In the street it’s even harder as you are trying to run as fast as possible without a machine to steady your pace and all the while remaining safe amongst traffic in the real world™ As the zombies draw ever closer, a robotic voice counts down their distance with a, “Zombies 15 meters!” or worse still a, “Zombies 5 meters!” As the bastards catch up with you then the sound of their moaning increases in your headphones and if that doesn’t get you moving faster then nothing will! After about a minute of this level of exertion the voice will announce you have either been caught or evaded the monsters and you can slow back down. The iPhone interface has a number of screens detailing different parts of the game. 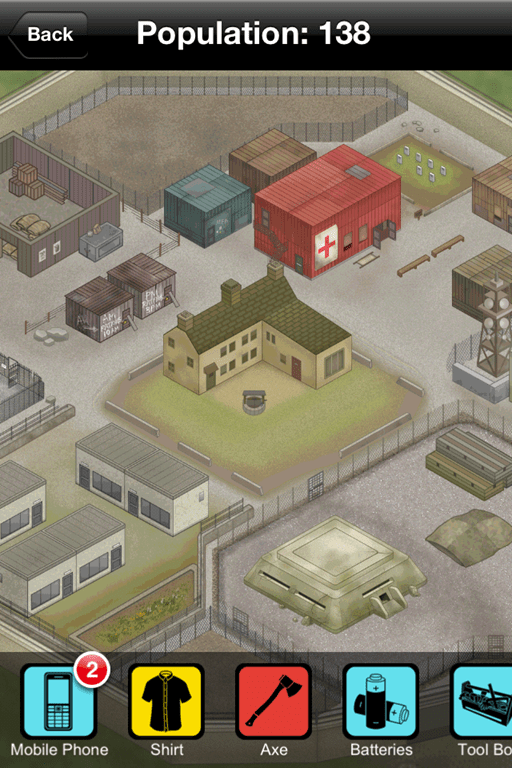 The Home screen shows the township as a walled enclave with various buildings around a central farm. It also shows the township’s current population, which increases as you complete missions. The Missions screen shows your progress though the basic set of missions. There are currently 23 story missions showing on my screen (I have season 1), which are fully voice acted and move the plot on, and 7 supply missions that are designed to be rerun. The “Zombies, Run!” blog says that they are working on recording further missions as a DLC. Including a 5km run. 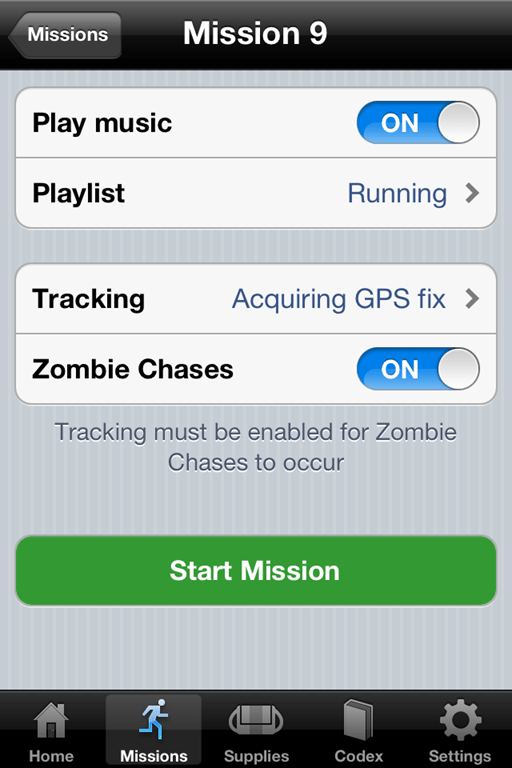 Selecting a mission brings up the run options, which include your method of tracking and whether you want zombie chases in the game. I have played with all three and find that having the phone in a pocket works best for me. Although having said that, I did have a funny occurrence on a mission while down the gym. I was running on the machine and a zombie chase started so I sped up. I narrowly escaped the monster and was almost out of breath. Then my phone must have rang, but I didn’t hear it because somehow it answered straight away. A few paces later I hear, “Hello?”, which I took to be in-game acting. “Basho, you there?” Wow I thought, that’s amazing voice acting, it sounds just like my boss… wait a moment! “Hello… Pete?” I said, still running and gasping from the chase. “You OK?” came Pete’s voice. Of course, I can’t turn off the phone part of the iPhone without the tracking going with it so this may happen all the time! The Supplies screen is where you drop off the supplies you have picked up to parts of the town. Matching the correct supplies to the correct part of the town means that that part will eventually upgrade and the graphic will change to show the impact of that on the structure. 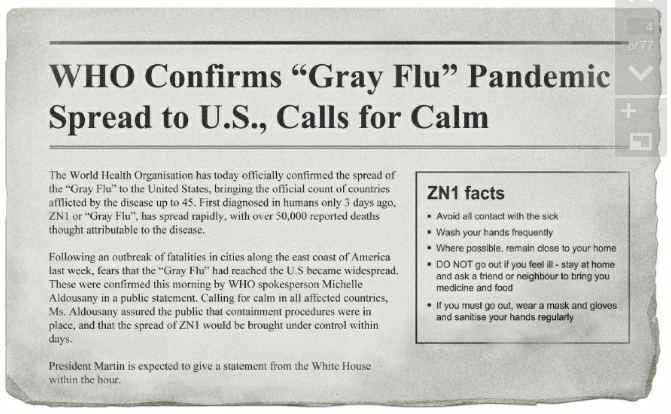 This gives a feeling of improvement and a reason to care about being caught by the zombies. It also unlocks the new missions, with certain structures requiring upgrades to different stages for a particular mission to be available. The Codex screen gives the background on all the items, places and characters in the game. Each character is voice acted brilliantly including **SPOILER** one particular mission where you are rescuing a child from the zombies and her crying actually moved me and upset me greatly (my being a new dad). The Codex screen is not just “filler” either as secrets are hidden in here, including some which mention email addresses. Upon emailing those addresses you actually get replies that all tie into the plot. That the crew making this game go to this depth to immerse you in the Zombies Run world is highly admirable. 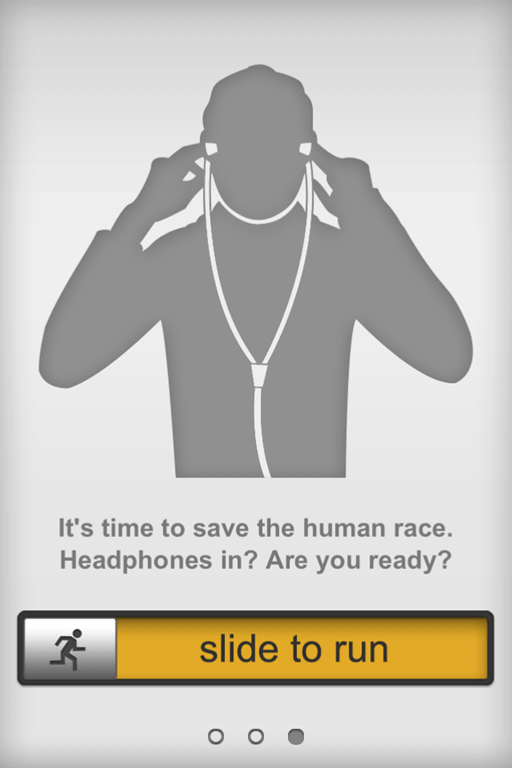 The Settings screen includes all the base settings such as whether you want to run for 30 minutes or for 1 hour. The game makers have thought of almost everything in this regard. If you run over the time chosen then the game switches to a Radio mode where voice actors introduce tracks on a “fake” radio station. You still collect items and indeed have zombie attacks. The radio station plot is very well designed with the DJs giving “news” about the areas infections and flesh out the background of the game. 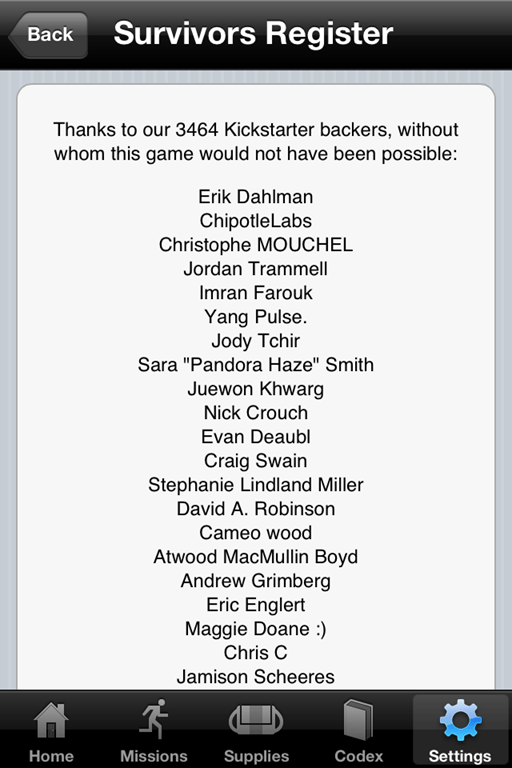 Also in this screen is the “Survivors Register”, which lists all the people who donated to the project. For “Zombies, Run!” is a Kickstarter project and surely settles the argument for the value of this fashionable funding method. That such a quality product came out of Kickstarter and actually got made is incredible. Motivation is lightning in a bottle and if you could really capture, define and sell it then you would be a zillionaire. I am not a great fan of Zombies as a genre and stick very firmly to the funny/tongue-in-cheek side of the canon. I like Shaun of the Dead, the 28 days/weeks later series and some of the classics like Dawn of the Dead. I stay away from the more hard-core Zombie stuff. I also have no love for the “Zombie” modes found in many modern computer games such as Call of Duty and Red Dead Redemption. However, even I “feel” an exhilaration when chased by these monsters that does indeed motivate me to run faster. I am also fully immersed in the story line and find the writing to be of the highest quality. This directly leads to my wanting to run more often to continue the adventure. I also find some parts of the experience quite funny. Not least of all the fact that (somehow) my iPod keeps queuing “relevant” tracks to the situation. **SPOILER** So, in a mission I am told that I must save a large group of people trapped by zombies by getting the “Zoms” to chase me instead. What song comes on? The Best by Tina Turner. Another time I was being run down by Zombies and a chase was announced. What song did I run away from the Zombies to? One way or another by Blonde. More than this, I do find the motivation to go harder for longer. The other day I was finishing up my run and had 200 meters left to go. Normally I would slow down by this time and perhaps even walk the last 50 meters. Then An Empire State of Mind by Alicia Keys came on and I finished that last 200 meters like I was running for an Olympic medal! 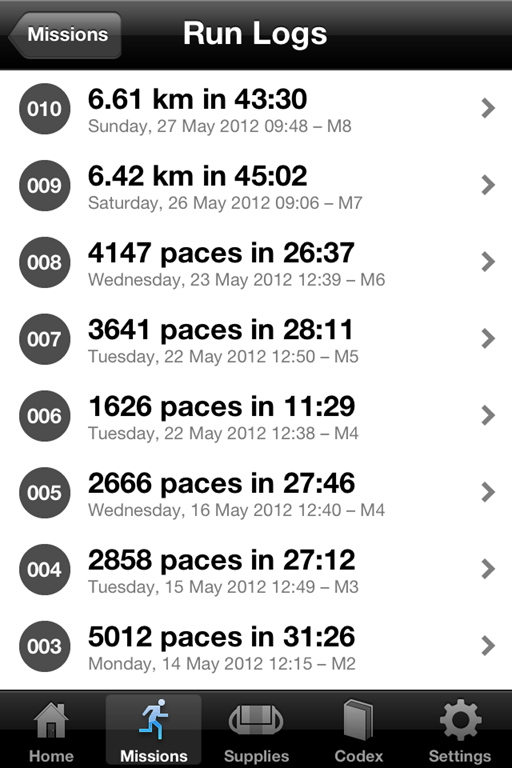 Mind you I am still quite new to running with only a year on the clock (my Nike level is Green for example). I am not a burned out runner sick of the sport and actually in need of motivating. I am also not a competitor, indeed thanks to my injury over Christmas I was unable to compete in the Half Marathon I had planned this year (Grrrr). I am also not particularly fast, running a 5k in 29 minutes on a good day. On the other hand I listen to podcasts and Audible books all the time while running, so this format suits me down to the ground. I am also a type of IT Consultant and so I am very at home with technology. So those caveats in mind: I love “Zombies, Run!”. It has brilliant acting, a clever game design, crisp writing, subtle extras and is well programmed. What more could one want to be motivated and have fun at the same time? With companies spending millions devising cool tech to motivate runners, this simple idea stands head and shoulders above them all. It costs a fraction of the cost of a Nike Fuel Band and will keep you interested for weeks if not months. It’s like being excited to watch your favourite shows’ latest episode, you can’t wait to see how it turns out in the end. If only to see if you are going to get eaten! 10/10 – best thing on the app store!